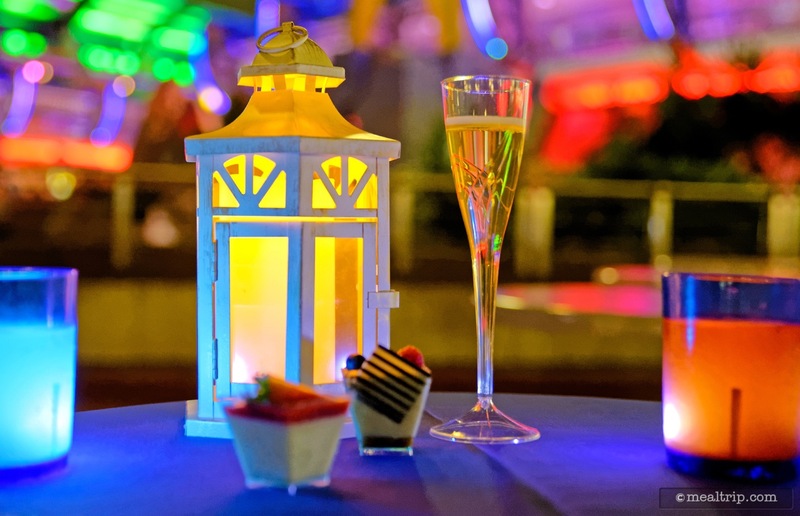 The Wishes Fireworks Dessert Party takes place on the Tomorrowland Terrace covered patio adjacent to the counter service restaurant of the same name. The location offers a very nearly unobstructed view of Cinderella’s Castle, "Celebrate The Magic", and the Wishes Nighttime Fireworks show. A partial view of the Main Street Electrical Parade can also be had, depending on where you're seated. A couple of buffet tables with delectable desserts are set up along with stations for a hot drinking chocolate, signature lemonades as well as coffee and tea. The dessert selections do change from time to time, but usually include Chocolate Dipped Strawberries, a Ghirardelli® Chocolate-Chip Cheesecake Brownie, Oreo Mickey Mousse, Crispy Treats, Tiramisu, Chocolate Peanut-butter Tart, Cannoli, Panna Cotta Themed Cupcakes, Ice Cream, Seasonal Fresh Cut Fruit and a Cracker, Cheese, and Dried Fruit Platter. 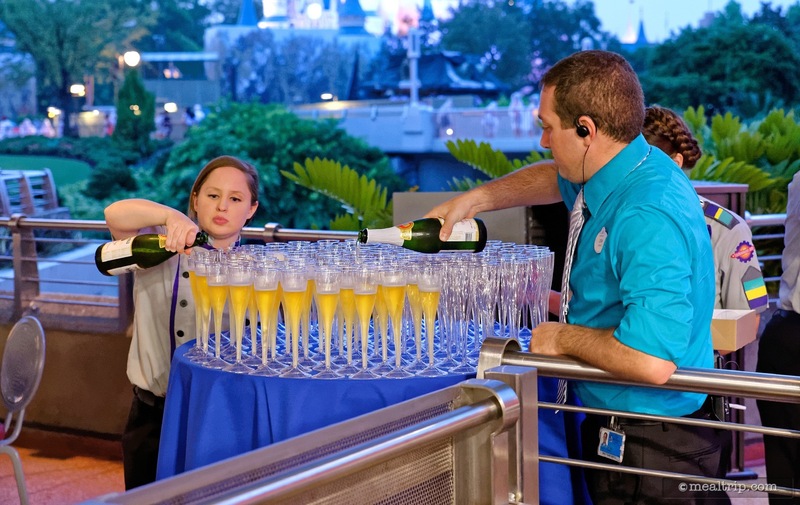 You also get to pick up a flute of sparkling cider on your way into the event, and a toast is parlayed by your seating host or hostess once you arrive at your table. 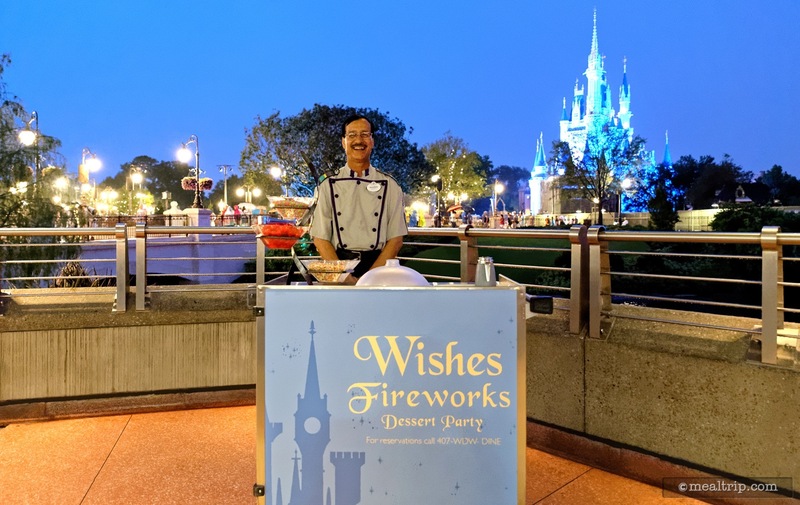 The new "Wishes Fireworks Dessert Party" takes the place of one of the first "value-added" events that had been introduced at the Disney parks… which was the guest favorite "Tomorrowland Terrace Dessert Party". The old event had a reputation for being a great value (in terms of Disney events anyway), but frankly... it was only a matter of time before the price had to be increased. 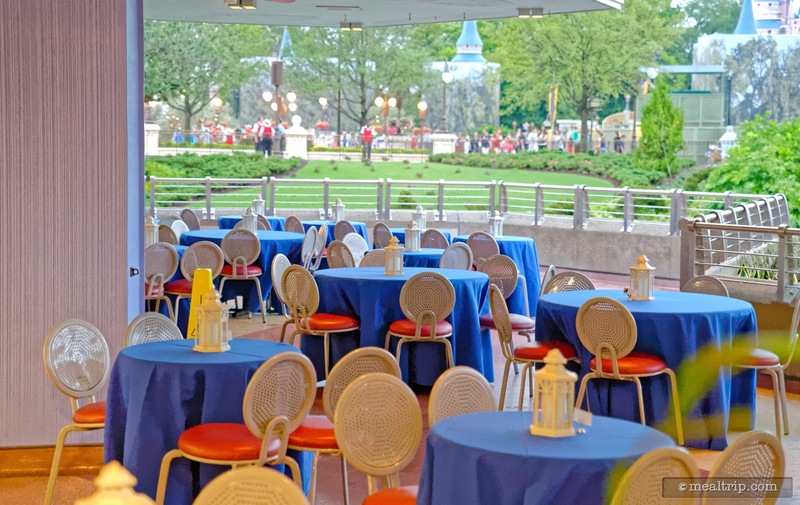 The new offering not only follows in the same format as the old event, but also takes place in the same location, which would be the foothills patio landing of the Tomorrowland Terrace restaurant. In fact, if you're not into reading long reviews, not much has really changed. There are a few new items, but you'll have to read along to find out what those are! The event begins approximately one hour before the Wishes fireworks. 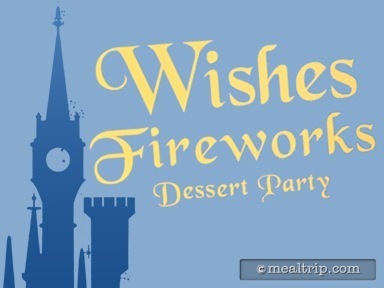 So if Wishes is meant to begin at 10pm, the dessert party should begin around 9pm. Because your party must check-in and get a paper wristband prior to entering the event space, a line does tend to form. In fact, the line can start forming as early as one-hour before the beginning of the party. Do you really have to be there that early? Only if you absolutely want the most time to eat desserts. Usually within 15 minutes, everyone that was in line... is well into the event space, and there's still ample time to fully get stuffed full of desserts. Before sitting down, everyone in your party gets to pick up a plastic flute of Martinelli's Sparkling Apple Cider (non-alcholic), and you are led to your reserved table, (with chairs), where your host or hostess will offer a "wishes" toast (and go over a few rules, such as "you're not allowed to move the chairs closer to the railing, etc.). But really, one of the best parts of this party, is the chair. A real live, actual honest to goodness chair! There are only two other seasonal dessert parties at Disney parks that I can recall that have chairs, so this is a pretty big deal. Getting to sit down at the end of the day, in front of a cloth covered table with a flickering lantern centerpiece... under cover, is really nice. Add in a giant glowing princess castle and you have a truly great setting for a dessert party. So a few nuts and bolts about what you can and can't see before we get to the desserts. You do get a rather unique view of the Main Street Electrical Parade. It's not like being front row street-side of course, but the floats that are taller than people (Pete's Dragon for example) seem to glide by in the distance. The music for the parade is at a pleasant background-music level, and so the whole parade is a nice little unexpected perk. Guests that are sitting near the entrance or the very back of the dessert party space, may need to walk up to the railing to see it though. There is usually a showing of the "Celebrate the Magic!" just before (and after) the fireworks, which you can get a great view of. It's around this time though, that guests go to the railing in order to get a better view of the Wishes Nighttime Spectacular (fireworks). There is just enough railing around so that guests are only one-level deep. You may have to walk up and down the landing a bit to find a spot though. 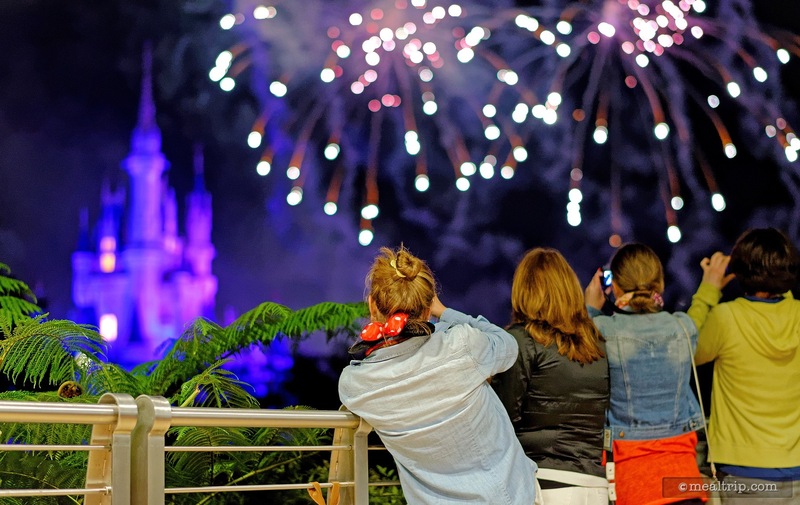 You can stay in your seat to watch the fireworks, but your view will be partially obstructed, a bit by the overhang and a bit by the guests that have gone to the railing. I would say around 25% of the guests do stay in their seats though, and I'm usually one of them. I can see Wishes standing up on another night… but how often will I have a plate of chocolate covered strawberries in front of me, while Wishes is going on? The only "rule" here is, you can't move your chairs up to the railing, you do have to stand (insurance purposes and such). Some have said they don't like the view of Wishes from this location because the fireworks do not appear to be going up directly behind Cinderella's Castle. The only place you're going to get that view... is on Main Street. There's no fooling physics, the dessert party event location is about 250 feet to the east of plumb center, so if you're a stickler for that sort of thing… the view is a little off. On to the desserts. The offerings at this "new" version of the dessert party, haven't really changed much. There are a few new items here and there, but there were (and still are) seasonal changes to this dessert menu as well. 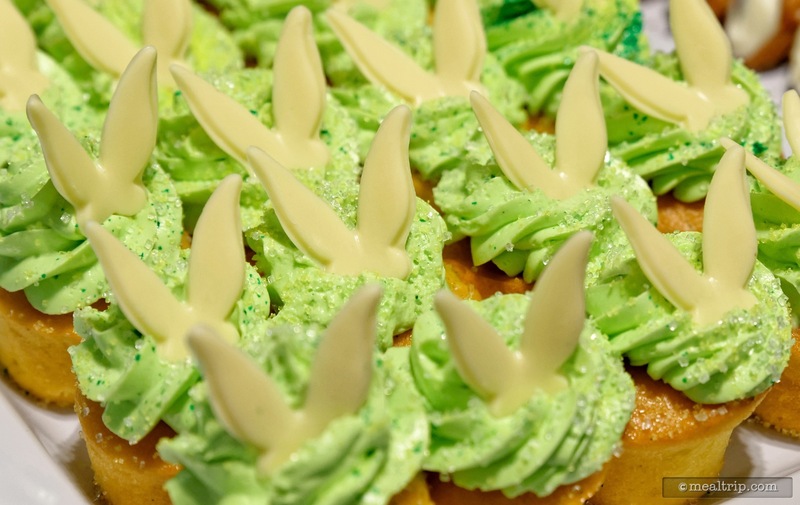 The words "Disney character-themed cupcakes" seemed to be big part of Disney's new description for the event, but as it turns out, this is not a cupcake-palooza. 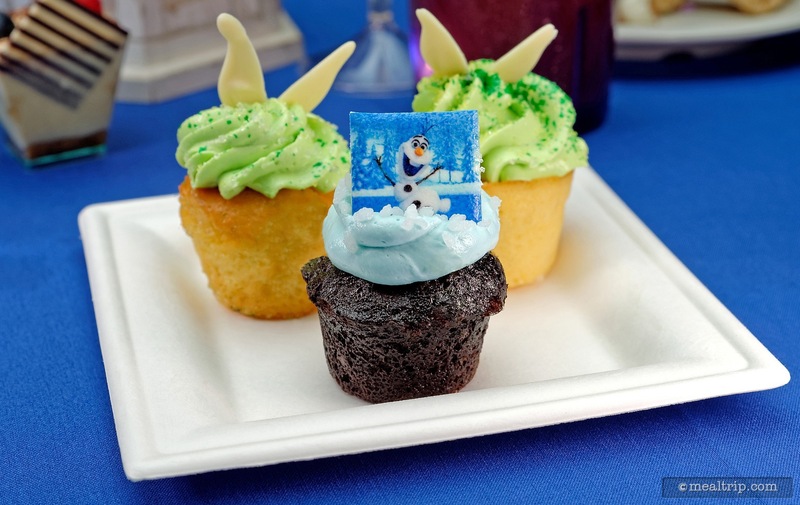 On opening night, there was a chocolate Olaf mini-cupcake and a vanilla Tinkerbell mini-cupcake, both with your standard buttercream frosting… pretty… and they tasted like mini-cupcakes. The powers that be told me that they would occasionally run out of the cupcakes before (they are a highly sought after item on the dessert tables apparently), and that is less likely to happen now. So there's that. For those of you that follow my musings on this site, you'll know I'm becoming a bit melancholy about the multitude of mini-cupcakes that are showing up at these things. It's just not my thing I guess. The Chocolate Dipped Strawberries are still present, and so that's a good thing. I never grow tired of Chocolate Dipped Strawberries. There's another new dessert that is truly a show-stopper… the Ghirardelli® Chocolate-Chip Cheesecake Brownie is the kind of dense, sweet, proper dessert that I wish there was more of on the buffet. We're told that this new item is one of the desserts that will change a bit seasonally. For example, in the fall it will become a Ghirardelli® Chocolate-Pumpkin Cheesecake Brownie. 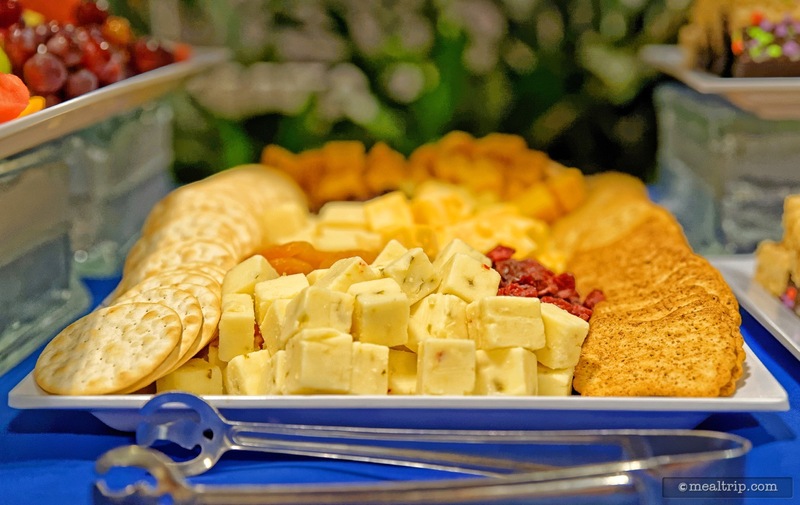 A new cheese, crackers, a dried fruit platter has been added. For me, this was a much needed savory addition to the dessert line up. The fresh cut fruit platter also remains with slices of watermelon, pineapple, mango, cantaloupe, and grapes. 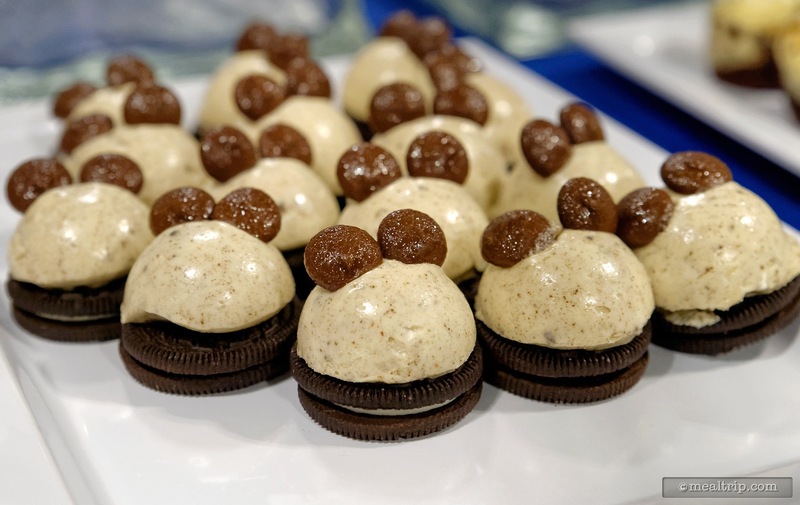 The Oreo Mickey Mousse is a dome of mousse on top of an Oreo, complete with little chocolate ears. The Chocolate Peanut Butter Tarts are also a guest favorite, for those guests that like peanut butter (which I do, and it's getting harder and harder to find in desserts these days). 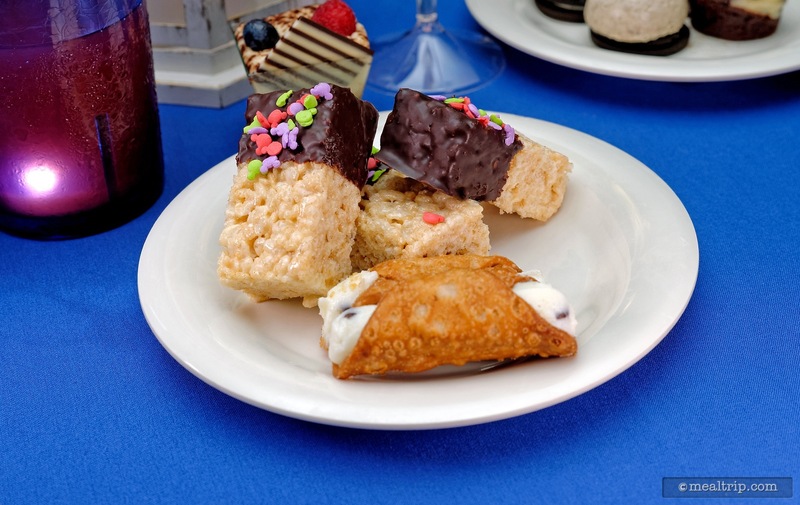 Rounding out the chocolate food offerings are the half chocolate dipped Rice Crispy Bars. 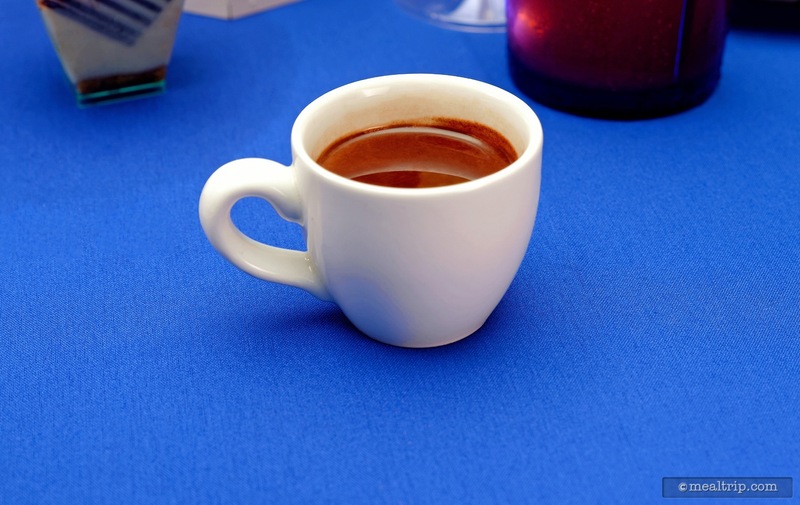 There is a new Drinking Chocolate that has been added to the dessert menu, and yes… even though it was still 90 degrees out, I had a couple small cups of this. (Those cute little cups in the photos are in fact, the cups that used to be used for the creme brûlée that has been removed from the line up.) For those of you that are familiar with drinking chocolate (i.e. 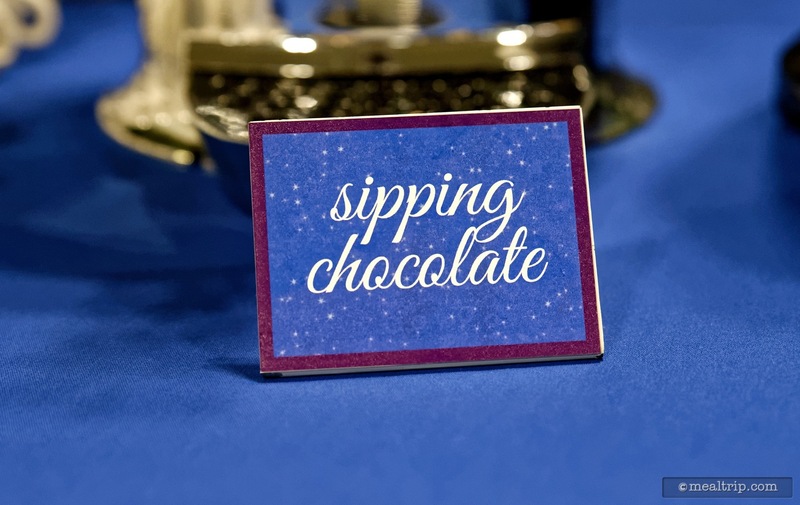 the kind you can get at the Ghirardelli® kiosk during Epcot's Food and Wine Festival)… this version… is not "quite" proper drinking chocolate. It's a little thinner, more like a dairy-based hot chocolate, and not the water-based hot chocolate that is served bulk-style during Mickey's Very Merry Christmas Party. But, it's still quite good, and I even found a few people dipping things like Cannolis into it... chocolate fondue style. What remains are some of the same desserts that were at the previous version of the party, Tiramisu, Panna Cotta, and Cannolis. There is also an Ice Cream Sundae cart, (vanilla ice cream only), with a few various toppings (sprinkles and such). The staff here, was top notch. Friendly, helpful, and glad to be working the party... you couldn't really ask for much more. They stayed on top of clearing away the plates, without being too aggressive and were always ready to lend a hand or answer questions. The environment though… is a slightly different story. 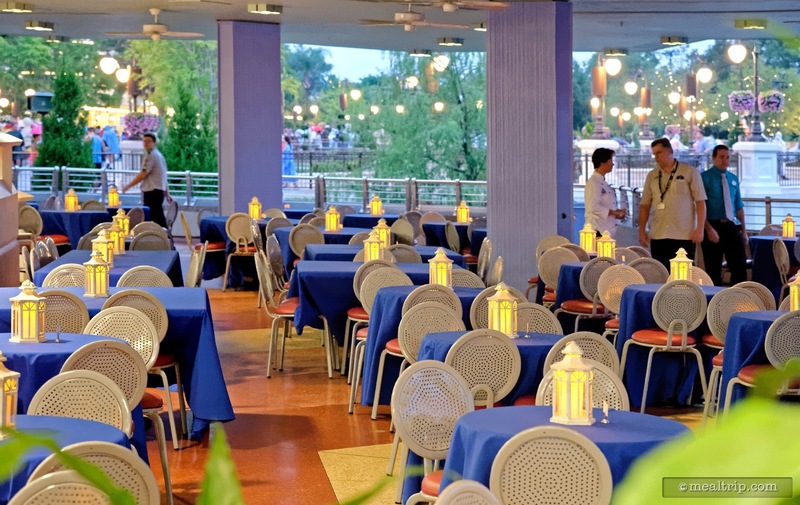 While the new overlays (paneled bits with printing on them that make all the carts look spiffy for example), table cloths, and centerpiece lanterns are nice improvments... the actual floor, walls and ceiling are looking very, very dated and run down. The dimly lit area needs some freshening up with a bit of architectural lighting, a pressure washer, and some paint here and there. The cost -vs- value equation is what seems to have been changed most with this newly updated event. The Tomorrowland Terrace Dessert Party had been in the $26-$32 dollar range per adult, depending on the season. 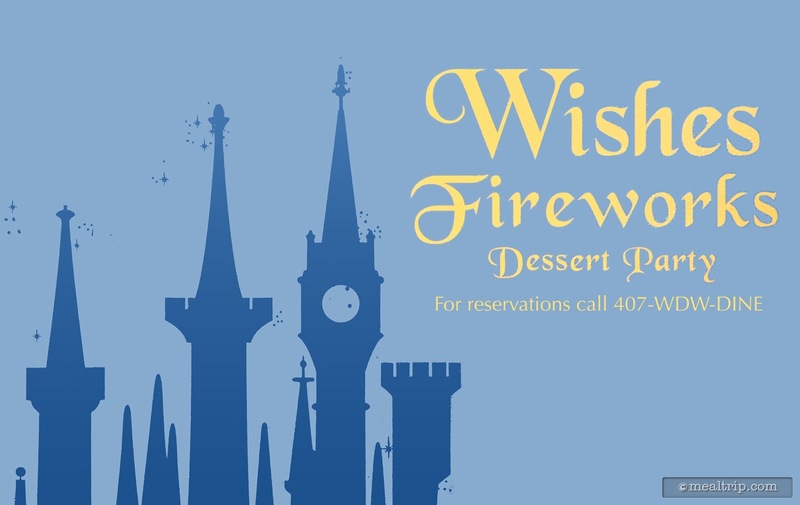 This new Wishes Dessert Party is being offered at $49.99 per adult, plus tax (which we assume, will go up a bit during peak periods). That is very nearly double the cost of the previous version. 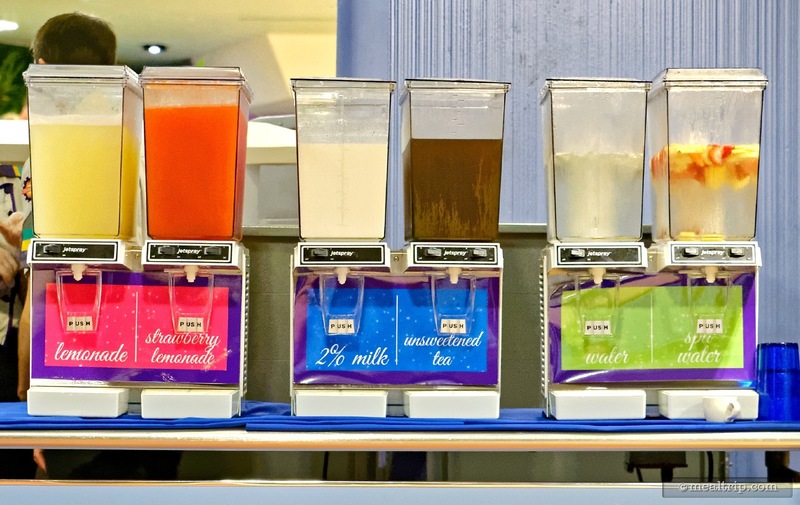 It is a shocking jump… but in reality the Tomorrowland Terrace Dessert Party had been priced a bit low, for a long time, when compared to other dessert party offerings at Disney parks. Is it still a good value? For me… it's a special occasion event that I would (and have) taken family to as part of a birthday or some similar celebration. It's not something I'm going to do every time I go to Disney. It's a splurge to be sure. While the dessert, cheese, and fruit offerings are decent and varied enough so that everyone should be able to find one or two things that the really enjoy... it's the value that you place on being able to sit for an hour, under cover, without fighting any crowds, while you wait for the Wishes fireworks to begin... that really makes the "value" case. It really does make you feel special... comfortably sitting on a giant patio, eating chocolate covered strawberries, waiting for fireworks. It's a memorable ending… to a great day at Disney. The fact that you have an additional 15 minutes after the fireworks are over to stroll back to the dessert buffet and pick up one last helping of your favorites, without being pushed out of the area… is another huge bonus for me. By the time the second showing of "Celebrate the Magic!" begins, most guests have left, and you can often watch the entire presentation, in your chair!!! Even at $49, the Wishes Dessert Party still gets a solid recommendation from me. If you only get to go to Disney once every few years, and you haven't done one of these in the past… it really is a neat little event that seems to come up in conversations long after the vacation is over.